Perhaps she’ll have the opposite experience? No documented best practices, but lots of administration. No coaching program, but generic 1-day training courses. In ad hoc sales organizations, new hires quickly discover that sales results are completely dependent on individual best efforts. Sharing of knowledge within the team are non-existent, further impeded by the lack of enabling tools and technology. There is no defined sales process or methodology to follow. Success and failure is random; there is no way of knowing what works and what does not. Rather than planning ahead, everyone is chasing enough deals to survive the next quarter. The pipeline consists of unqualified and stalled deals. Prospecting efforts are inconsistent, with no guidelines on what qualifying questions to ask and what answers to uncover in this process. Marketing is isolated from the lead generation process and the work required from sales to generate new opportunities is only acted upon when a sense of urgency sets in. Needless to say, this structure (or lack thereof) produces unreliable forecasts and unpredictable results, often resulting in high staff turnover, missed targets and failed on-boarding programs. To get from ad-hoc to excellence, one fundamental building block is to map out your sales process. Sales organizations at this level evolve from the performing stage naturally by continuously improving its people, processes, methodology, best practices, skills and culture. The iterations are embedded in the sales infrastructure and create a long-term competitive advantage. When asked sales managers too often describe if and how they work with a sales process with “it has not been formalized yet” or that it is a drop-down list with sales stages that came with the CRM. Sometimes it’s in a binder on the shelf, untouched since the day it was provided by the sales training company, or it’s a laminated poster on the wall. The sales process is rarely “operationalized” and used to drive the right behaviors over time – subsequently, when the world around us changes, the sales process does not change with it. Using a metaphor, the sales process is like a treasure map. It has a clear starting point and a big X marking the treasure. There’s never a straight line to get to the treasure and in sales it’s a journey you make with your prospect. There are likely to be many stakeholders involved and it will take some time to get there. The map will outline important milestones and provide guidance along the way, but the journey will involve many challenges to overcome, which will vary from case to case. You need to be extremely clear about who your buyers are and which value propositions they will find relevant. Which customers are most profitable and how do we get more of the kind? How much up-sell potential do we have within our existing customer base? Your team needs clear guidelines on how to qualify, and when to disqualify, leads. Spending precious sales time with prospects who will never buy from you is far too common. A clear definition of customer fit and a structured pre-qualification process, gives your team the conditions to fill the pipeline with quality sales projects. Crucially, when we decide to invest the time in an opportunity, it needs to be very clear to your sales people what they need to do, with whom, when and why. Let's start with the broad strokes, the stages. A memorable sales process HAS to be staged, it also helps people to visualize it. The next step is often to start to track activities. But in most cases, they lack any meaningful context which makes it like tracking how many nails a carpenter has put into a wooden board. 5000 nails into a wooden board does not indicate progress on a house. And sales people shouldn’t mindlessly perform non-value activities throughout the sales process. This is because most fail to define the milestones and key steps within the stages of the process. Milestones can include understanding where the buyer is in the process, and ensuring that we engage all the relevant stakeholders. At different milestones, you may need to use scorecards or other tools to determine how much company resources should be invested into the sales project. Place each milestone within the appropriate stage, and train salespeople to meet them within those correct stages. This will immediately address the common problem of presenting solutions and discussing price too early. Once the sales process is built and salespeople are trained, it’s not enough to simply let it do its thing. Leading sales processes continuously improve by soliciting and responding to feedback from reality—from the salespeople, from buyer behavior, from win/loss analysis. Take this feedback and codify the winning activities and resources into the process, build in activities to prevent the bad things happening, and remove activities that have neither a good nor bad effect. This latter activity ensures that the process remains relevant, actionable, and that salespeople aren’t wasting their time. Done right, the process becomes your “structure capital” to speed up the time to ramp up time for new hires, minimize costly sales mistakes create more accurate forecasts and consistently reach your sales targets. Companies must invest in technologies that turn process and methodology into second nature by providing salespeople with guidance, reminders and resources. Using sales effectiveness software (like Membrain, for instance) allows sales leaders to build in not only checklists, but also videos and content that explain why each element is important, content to send to the buyer based on their place in the process, dynamic reminders when steps are missed, and access to training content relevant to each step. "But every deal is different!" One common objection to the idea of a granular sales process is that every sale is different. This is especially true for complex sales, where multiple decision makers are involved and there are many moving pieces. It’s for this reason that sales processes often stay at the high level of “stages” that can be more-or-less applied regardless of the complexity of the sale. A successful process is dynamic, changing as the conditions of the specific sale change. For instance, if the salesperson knows they’re up against a particular competitor, a dynamic process should prompt them to tailor conversations and content to address perceived strengths and weaknesses against that competitor. Having a sales process is great—adhering to a seller-focused process heedless of what the buyer does is suicide. Many sales processes focus on what the seller should be doing at each stage, and fail to align those activities with the buyer’s process. It’s a natural mistake, because the seller’s activities are visible and trackable, while the buyer’s behaviors may be less so. This makes it hard for the two to get in sync. Incredibly few companies have implemented an effective, actionable sales process that meets the needs of the current market environment for their industry. This failure has led to a global sales effectiveness crisis. One that gets worse every year. Bringing sales process up to best practice standards can be overwhelming. Leaders invest in sales methodologies, training, and technology, without addressing the root of the process problem, because they don’t know that a truly dynamic process is achievable. Start the implementation of your dynamic sales process with our sales process excel template. A free download that's a great starting point! There are so many great resources available to learn more about sales process. How to get started. How to excel. And what not to do, which is equally important. See below for some of the absolute thought leaders and resources in this space. Dave Brock - One of the sharpest sales minds out there, has been developing high performance organizations throughout his entire career. 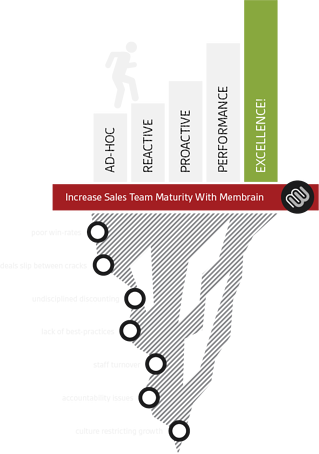 For more detailed information around how you can implement, customize and reinforce your sales process in Membrain, click here!